The software and models listed here were originally written in MATLAB 5 and Simulink 2, under Mac System 7-ish, starting in 1995(!). The software has been updated and tested regularly over the years, and is in daily use under MATLAB 2018a on macOS 10.9 and up (with some testing up through Windows 7). There are currently no show stoppers, though there may be some cosmetic issues. In some cases Simulink models may respond with a flurry of non-fatal warnings. I have tried to catch and fix these whenever possible while modifying the models for modern Simulink versions. If you wish, type "warning off" at the command line to suppress them (at your own peril!). NOTE: Some functions require the MATLAB Signal Processing Toolbox. If you have any questions, email Dr. Jacobs at jxj24 (at) case (dot) edu. --You can now import Eyelink EDF files in addition to the prior formats. --The saccade parser, "findsaccs" has greatly improved sensitivity and selectivity, along with a GUI to make interactive examination of your data easier. --Blink removal from non-digital (i.e. non-blanked) data sources (e.g. Eyelink analog output) is likewise improved using "ao_deblink". --Post-facto data calibration using "cal" has been streamlined and simplified. --All graphics-based tools have been thoroughly modified to work smoothly with the most recent versions of MATLAB. --Zoomtool has been updated to allow multiple independent instances that can be controlled programmatically. --Far simpler, more reliable installation process. The eXpanded Nystagmus Acuity Function (NAFX), included in the OMtools distribution, is a powerful analysis tool that uses relevant nystagmus parameters to predict the best-possible visual acuity for nystagmus data based on the presumption that no afferent deficits are present. To the extent that deficits are present, the measured acuity will fall below the potential acuity. Once both acuity and nystagmus data are measured, the NAFX can also be used to estimate the improvement in measured acuity subsequent to therapy. The NAFX works for uniplanar and biplanar data. UPDATED Feb 2019: The GUI for NAFX has been updated for modern versions of MATLAB. It is now faster and easier to explore and test your data. For questions regarding the use or interpretation of the NAFX in specific cases, email Dr. Dell'Osso at lfd (at) case (dot) edu or Dr. Jacobs at jxj24 (at) case (dot) edu. The Ocular Motor System model is a functional, behavioral model capable of simulating ocular-motor responses to specific target stimuli. It simulates the responses of normal subjects as well as those with a variety of disorders including congenital (INS), latent/manifest latent (FMNS), and gaze-evoked nystagmus (GEN), various types of saccadic intrusions and oscillations, and ocular myasthenia. Instructions for use are in the OMS Model v1.5 User-Guide below. Please note that at this time parameter settings are controlled using the simpler, previous GUI. You will need to download and install the current version of OMtools before using the model. For questions or suggestions regarding the use or expansion of this model, email Dr. Dell'Osso at lfd (at) case (dot) edu or Dr. Jacobs at jxj24 (at) case (dot) edu. This updated version works with modern versions of Simulink (2014b and up). There are no functional changes over the previous release. During the period from 1969 to 2013, human eye-movement data from appproximately 1237 - 1261 recording sessions and 887 - 919 subjects and patients were recorded for studies funded by Dr. Dell'Osso's Merit Reviews. These data were taken using paradigms designed to extract accurately calibrated data from each in the short time usually available when recording patients, especially infants and children. Some subjects and patients were recorded numerous times over many years and their data constitute longitudinal data sets for those individuals. The analog data from all are physically stored in the Daroff-Dell'Osso OMLAB facility at the Cleveland VA Medical Center. The following Figure illustrates the eye-movement recording activity of DD_OMLAB over those 50 years. 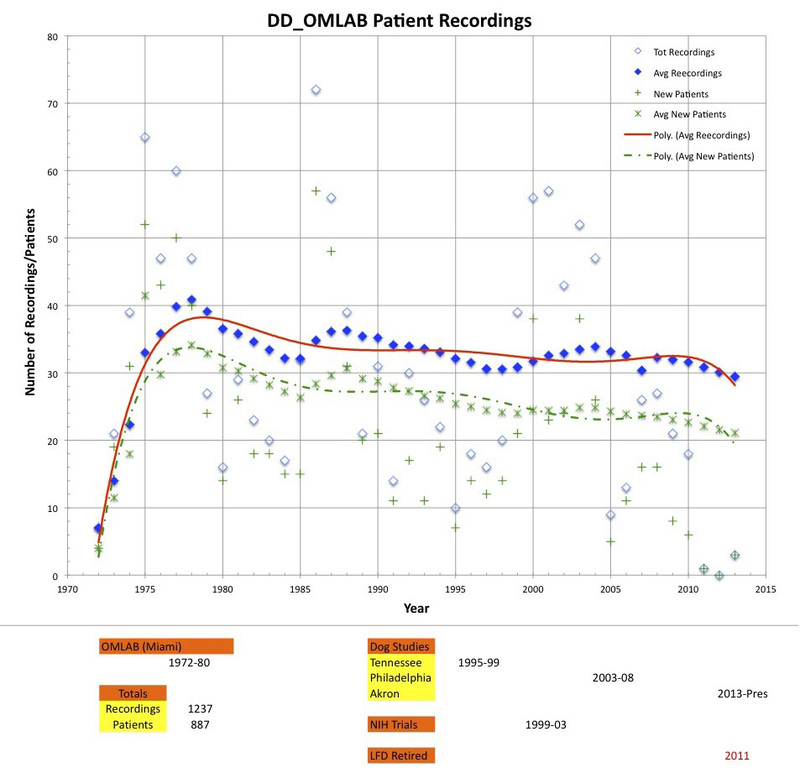 In the 38 years between 1974 and 2012, the average number of patient recording sessions remained above 30/yr, of which, the average of new patients was above 20/yr. Periodic fluctuations in these numbers reflect the starts of new funding periods. Begining in 1986, most data from approximately 722 recording sesions were simultaneously taken digitally and the data files from those sessions compose a valuable storehouse of research data. Those data are now being made available to all researchers, residents, fellows, and students of ocular motility along with the software tools (OMtools) necessary for their display and analysis. The data and their analysis will hopefully allow those unable to actually record the eye movements of affected individuals to test hypotheses and conduct future ocular motor research into nystagmus. Citation: Should any data from the DD_OMLAB Eye-Movement Database be used in a publication, the relevant DD_OMLAB S #'s should be listed and the citation should contain a link to this page. All data have been de-identified in accordance with current research practices to protect the privacy of each person recorded. The digitized, de-identified human eye-movment DD_OMLAB data available for downloading from this page is divided into four parts: 1) data in published papers from 2002 - 2014; 2) all data, published and unpublished, recorded from 1986 to 2013; 3) data recorded in 1984 in the laboratory of Dr. R.M. Steinman, from S001; and 4) data recorded in 1993 in the laboratory of Dr. H. Collewijn from a human with achiasma, INS and SSN. NOTE: Digitized canine data may be found on the [COMLAB] page. NOTE: NAFX is part of the OMtools distribution, available through the above link. Some programs require the MATLAB Signal Processing Toolbox. For questions regarding the use or analysis of these data, email Dr. Dell'Osso at lfd (at) case (dot) edu. NOTE: All data files are saved as zip-format archives. Beware: Many of these data files are quite large, despite having been compressed (eye-movement data is only slightly compressible). A high-speed connection is highly recommended. Those interested in obtaining the whole human eye-movement database (>1.6 GB) should contact Dr. Dell'Osso and request a DVD. 1. DD_OMLAB data in published papers (2002 - 2014) may be downloaded from each of the numbered papers listed below. The following are deidentified, downloadable copies of human subjects' digitized eye-movement data from papers published in refereed scientific journals. The criteria required for these data are: 1) all the data were collected in OMLAB; 2) our calibrated eye-movement systems were used; 3) our nystagmus paradigms were followed; and 4) the patient's privacy would not be compromised by release of the data.The subject numbers identifying each data set are consistent with those in their respective published paper. PDF's of each paper may be downloaded from (Downloadable PDF's) The 'Deidentified Human Research Data' document correlates the published S #'s with the DD_OMLAB Subject #'s, thereby allowing additional data from each published Subject # to be downloaded. NOTE: The document will be updated as new data are placed on line. Paper 116: Averbuch-Helller, L., Dell'Osso, L.F., Leigh, R.J., Jacobs, J.B., and Stahl, J.S. : The Torsional Component of ''Horizontal'' Congenital Nystagmus. J. Neuro-Ophthalmol. 22:22-32, 2002. Paper 119: Kim, J.I., Dell'Osso, L.F., and Traboulsi, E.: Latent Nystagmus and Uniocular Acquired Pendular Nystagmus Masquerading as Spasmus Nutans. J. Neuro-Ophthalmol. 23:198-203, 2003. Paper 120: Jacobs, J.B., Dell'Osso, L.F., and Leigh, R.J.: Characteristics of Braking Saccades in Congenital Nystagmus. Documenta Ophthalmologica 107:137-154, 2003. Paper 122: Shallo-Hoffmann, J., Dell'Osso, L.F., and Dun, S.: Time-varying, Slow-phase Component Interaction in Congenital Nystagmus. Vision Res. 44:209-220, 2004. Paper 128: Wang, Z., Dell'Osso, L.F., Zhang, Z., Leigh, R.J., and Jacobs, J.B.: Tenotomy Does Not Affect Saccadic Velocities: Support for the ''Small-Signal'' Gain Hypothesis. Vision Res. 46:2259-2267, 2006. Paper 129: Serra, A., Dell'Osso, L.F., Jacobs, J.B., and Burnstine, R.A.: Combined Gaze-Angle and Vergence Variation in Infantile Nystagmus: Two Therapies that Improve the High-Visual Acuity Field and Methods to Measure It. Invest. Ophthalmol. Vis. Sci. 47:2451-2460, 2006. Paper 134: Rucker, J.C., Dell'Osso, L.F., Jacobs, J.B., and Serra, A.: "Staircase" Saccadic Intrusions Plus Transient Yoking and Neural Integrator Failure Associated with Cerebellar Hypoplasia: A Model Simulation. Sem. Ophthalmol. 21:229-243, 2006. Paper 135: Wang, Z., Dell'Osso, L.F., Jacobs, J.B., Burnstine, R.A., and Tomsak, R.L. : Effects of Tenotomy on Patients with Infantile Nystagmus Syndrome: Foveation Improvement Over a Broadened Visual Field. J. Amer. Assoc. Pediat. Ophthalmol. Strab. 10:552-560, 2006. Paper 136: Dell'Osso, L.F., Jacobs, J.B., and Serra, A.: The Sub-Clinical See-Saw Nystagmus Embedded in Infantile Nystagmus. Vision Res. 47:393-401, 2007. Paper 137: Wang, Z.I., Dell'Osso, L.F., Tomsak, R.L., and Jacobs, J.B.: Combining Recessions (Nystagmus and Strabismus) with Tenotomy Improved Visual Function and Decreased Oscillopsia and Diplopia in Acquired Downbeat Nystagmus and in Horizontal Infantile Nystagmus Syndrome. J. Amer. Assoc. Pediat. Ophthalmol. Strab. 11:135-141, 2007. Paper 138: Wang, Z.I. and Dell'Osso, L.F.: Being "Slow to See" is a Dynamic Visual Function Consequence of Infantile Nystagmus Syndrome: Model Predictions and Patient Data Identify Stimulus Timing as its Cause. Vision Res. 47:1550-1560, 2007. Paper 142: Taibbi, G., Wang, Z.I., and Dell'Osso, L.F.: Infantile Nystagmus Syndrome: Broadening the High-Foveation-Quality Field with Contact Lenses. Clin. Ophthalmol. 2:585-590, 2008. Paper 151: Thurtell, M.J., Dell'Osso, L.F., Leigh, R.J., Matta, M., Jacobs, J.B., and Tomsak, R.L. : Effects of Acetazolamide on Infantile Nystagmus Syndrome Waveforms: Comparisons to Contact Lenses and Convergence in a Well-Studied Subject. Open Ophthalmol. J. 4:42-51, 2010. Paper 153: Dell'Osso, L.F., Hertle, R.W., Leigh, R.J., Jacobs, J.B., King, S., and Yaniglos, S.: Effects of Topical Brinzolamide on Infantile Nystagmus Syndrome Waveforms: Eye Drops for Nystagmus. J. Neuro-Ophthalmol. 31: 228-233, 2011. Paper 154: Wang, Z.I., Dell'Osso, L.F., Prakash, S., and Chen, X.: Smooth-Pursuit Changes after the Tenotomy and Reattachment Procedure for Infantile Nystagmus Syndrome: Model Predictions and Patient Data. J. Pediatr. Ophthalmol. Strab. 49:285-302, 2012. Paper 155: Dell'Osso, L.F. and Jacobs, J.B.: Normal Pursuit-System Limitations-First Discovered in Infantile Nystagmus Syndrome. J Eye Movement Res. 6(1):2, 1-24, 2013. Paper 156: Dell'Osso, L.F., Orge, F.H., Jacobs, J.B., and Wang, Z.I. : Fusion Maldevelopment (Latent/Manifest Latent) Nystagmus Syndrome: Effects of Four-Muscle Tenotomy and Reattachment. JPOS 51:180-188, 2014. Paper 159: Dell'Osso, L.F., Orge, F.H., and Jacobs, J.B.: Effects of Augmented Tenotomy and Reattachment in the Infantile Nystagmus Syndrome. DJO. 22:1-12, 2016. 2. All DD_OMLAB data, published and unpublished (1986 - 2013, recorded in DD_OMLAB) may be downloaded from each of the folders listed below. Data from 557 recording sessions on 347 subjects/patients are included. Each recording session usually contained 8-10 trials although some had only 1 trial and others as many as 15. The subject numbers and recording sessions identifying each data set are sequential and chronological, both inter- and intra-subject (e.g., S015_3 is the data from S015, session 3). The data from many sessions have associated 'adjbias.txt' files (necessary for easy loading into MATLAB using the OMtools program 'rd'. NOTE: Use current version of OMtools. If the data have been calibrated, the bias offsets and scale factors listed in the adjbias.txt file will be other than 0's and 1's, and the data will automatically be read in calibrated. If not calibrated, the data can still be read in and filtered (RECOMMENDED) by 'rd' and plotted using the OMtools plotting programs (e.g., 'plth', 'plthv', or 'plthvt'). NOTE: There are many 'plt__' usefull plotting programs in the OMtools 'labels' folder. To calibrate these data, 'cal' must be run on the two monocular data files (usually the first two files for ir and eyl data) and the resulting bias offsets and scale factors copied into the respective channels for all of the data files listed in the adjbias file. NOTE: Some stimulus files may also need calibration or re-zeroing. If no adjbias file exists, one must first be created using 'biasgen' and answering the questions based on the information found in the 'adjbias.txt' files and the 'Deidentified Human Data' and 'Deidentified Clinical Information' spreadsheets (below); then, 'cal' should be run to calibrate the data. Below are the data files from 557 recording sessions of all 347 subjects/patients. NOTE: Both spreadsheets will be updated as new data sets are placed on line. Updated spreadsheets and data sets also contain corrections and additions to earlier versions. ALWAYS download the latest data sets and spreadsheets and discard earlier versions. 3. 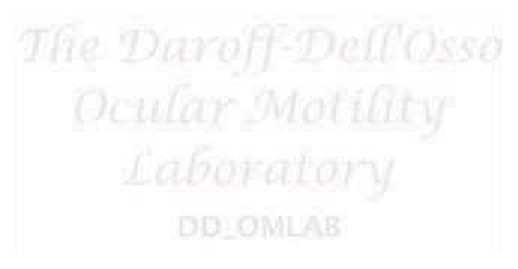 All DD_OMLAB data, published and unpublished (1984, recorded in the laboratory of Dr. R.M. Steinman) may be downloaded from each of the folders listed below. 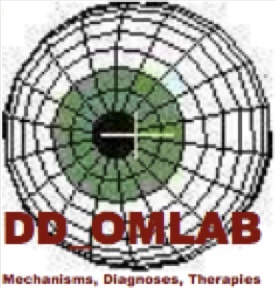 The subject was DD_OMLAB S001 and recording sessions identifying each data set are sequential and chronological. 4. All DD_OMLAB data, published and unpublished (1993, recorded in the laboratory of Dr. H. Collewijn) may be downloaded from each of the folders listed below. The first human achiasma subject recorded, AS001, had INS and see-saw nystagmus (SSN) and recording sessions identifying each data set are sequential and chronological.